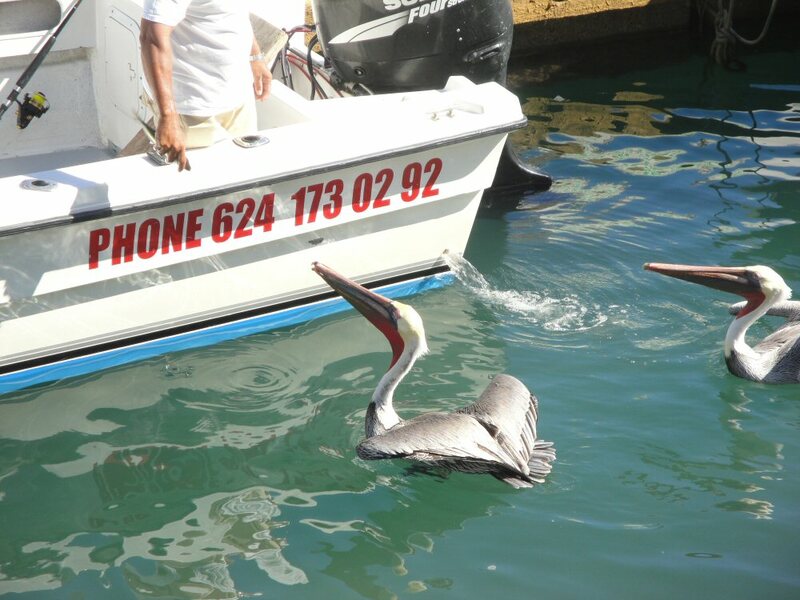 Our first time in Cabo San Lucas and what do we do? 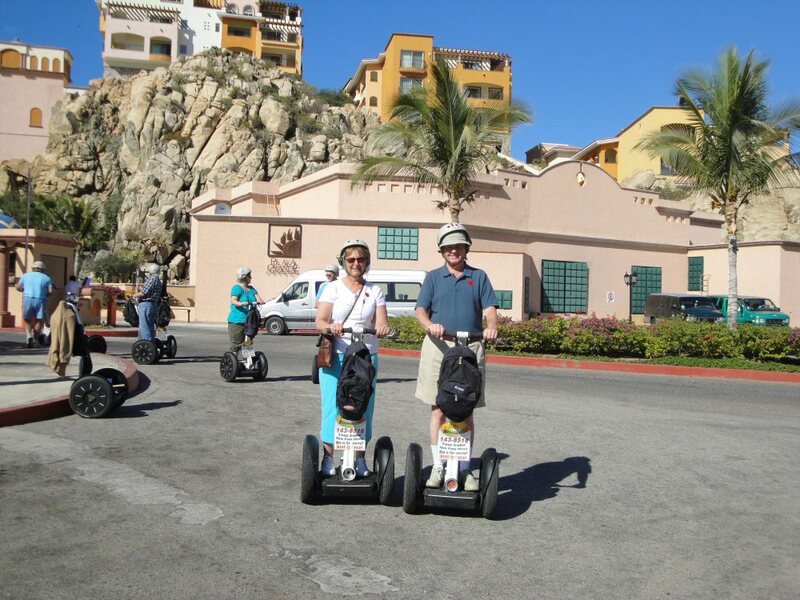 We join a Segway tour of course! 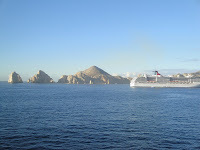 Actually it was a great way to see a good portion of Cabo in a short time and without a lot of walking. 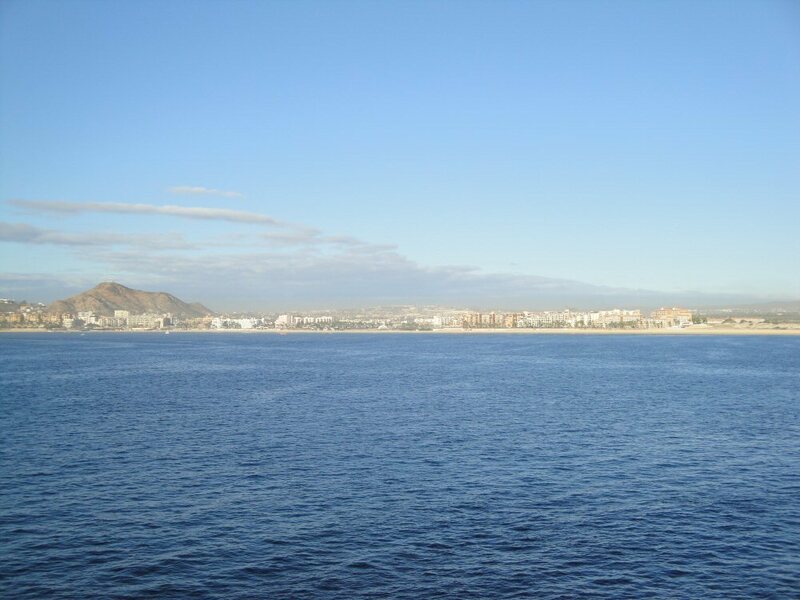 In fact, the most walking we did was to the tour office and back to the tenders of our ship. Cabo reminded me a bit of a Mexican Key West. Lots of stores, souvenir shops, restaurants, etc. Definitely a tourist town. 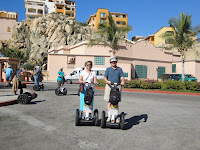 Since we have had quite a bit of experience on Segways, we had fun zipping around while other were getting their "Segway legs" which involves learning to get on and off without having the two-wheeled vehicle that takes off with the slightest motion of your body move before your feet are firmly planted. It doesn't take long to catch on and in about 15 minutes our whole group was ready to roll--literally. Cabo was colorful to say the least and very desert-like with lots of cactus everywhere. 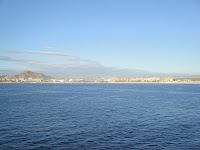 The mountains made a scenic backdrop to the beach town that is made up of resort after resort after condominium. 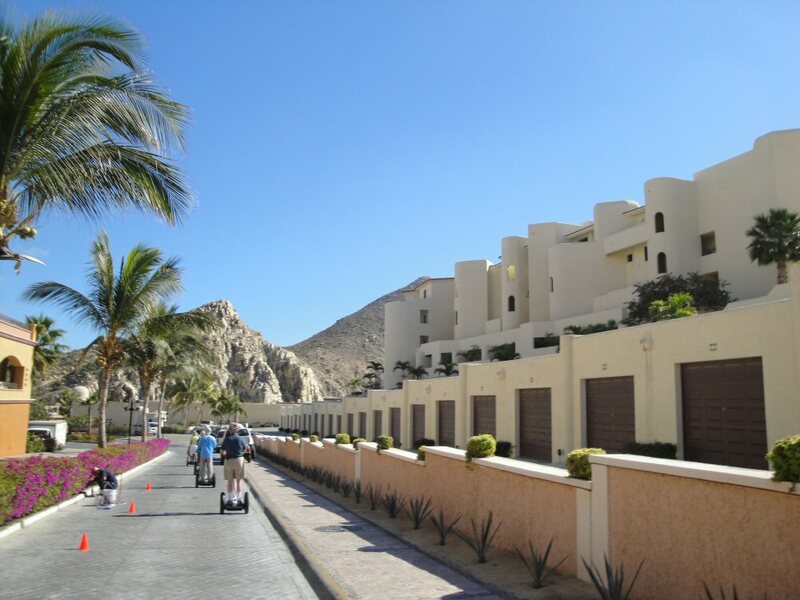 Some of the resorts that we rolled by were beaut ifully landscaped and I'm sure would have been impressive if we would have had time to look them over a little closer. Our tour guide was a little disappointed that there weren't any shoppers in the group. She seemed to know quite a few of the shopkeepers. While she gave a running commentary through the ear piece each of us wore, I didn't pick out a whole lot of historical information. But then I was concentrating on navigating some very narrow sidewalks filled with people and keeping out of the traffic lane as we rolled along the street in some places. I don't know why Segways have not been more popular. They are fun to ride but after an hour or so, your knees tend to lock up and your feet fall asleep. Of course around home in the winter, it could be a little rou gh in the snow and ice. 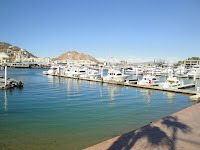 After our tour, we took a walk around the marina where our tenders were coming in. The area was full of interesting stores and restaurants. We stepped into one of the drugstores to purchase a bottle of water. I was surprised to see shelves lined with familiar looking pharmaceuticals that would be prescription drugs back home. I was surprised that there were a lot of vendors trying to hock their wares but it looked as though anyone inside the fencing that surrounded the marina needed a license or permit. There were vendors at some of the places along the fence that had no stores blocking the vendors from looking through the fence and showing their goods to passers-by. 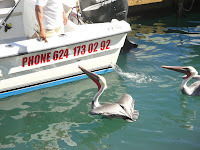 We stood and watched a fisherman as he tossed some fish to the pelicans. At least that's what we thought he was doing until we realized there was a big dark fish/creature under his boat swimming back and forth. It wasn't until we saw a seal on our way out of the harbor that we realized he was trying to feed the seal not the birds. After lunch on the ship, I spent the afternoon reading on our balcony looking across at the famous Land's End rock formation where all the snorkelers and beach people were enjoying the sun and watching the parasails float by. Karen you amaze me at all the stuff you try & are experienced with. Such fun! Karen, Thanks for promoting an amazing place. As a Real Estate agent and full time resident, I am sad we get mostly a negative rep for all the violence that is thousand of miles away. 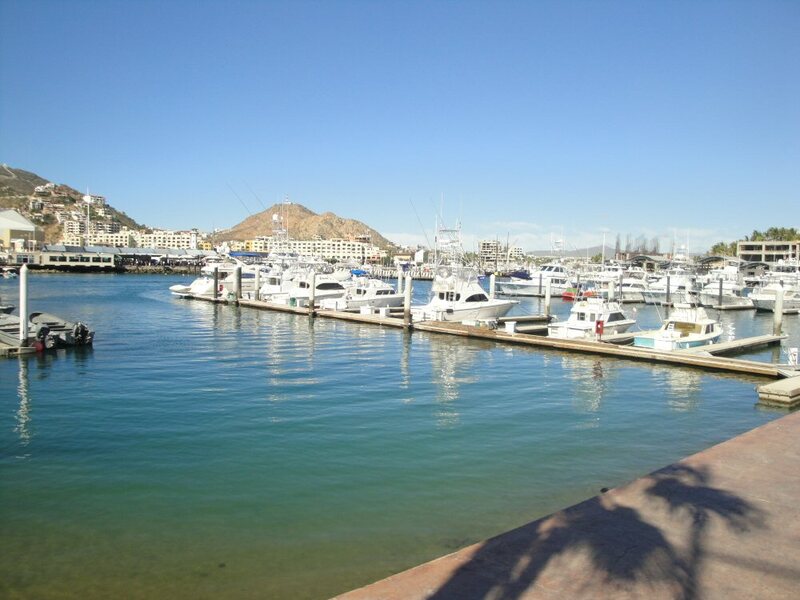 Once again, Cabo is amazing! I've always wanted to try a Segway. They look like they would be so much fun!